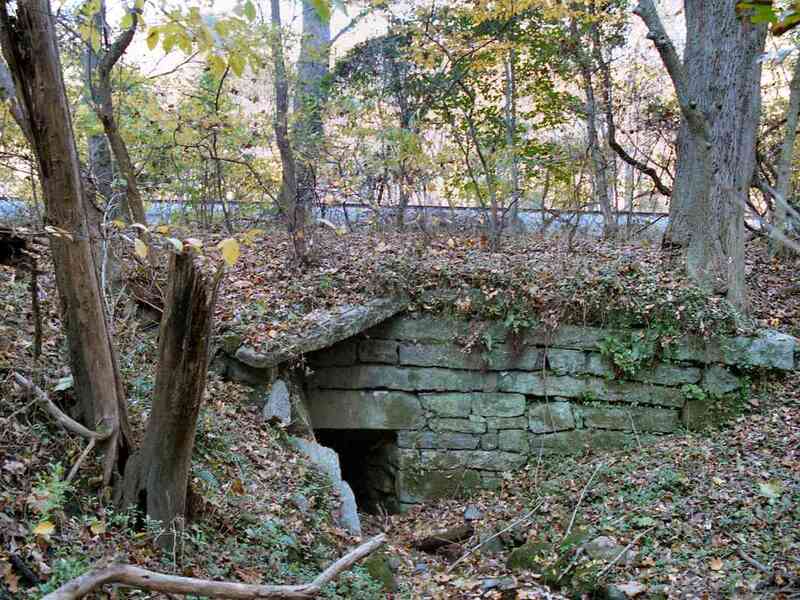 When the B&O built through starting in 1828, the tiny settlement of Lees had been perched along the south bank of the Patapsco River between Ilchester and Ellicott City. 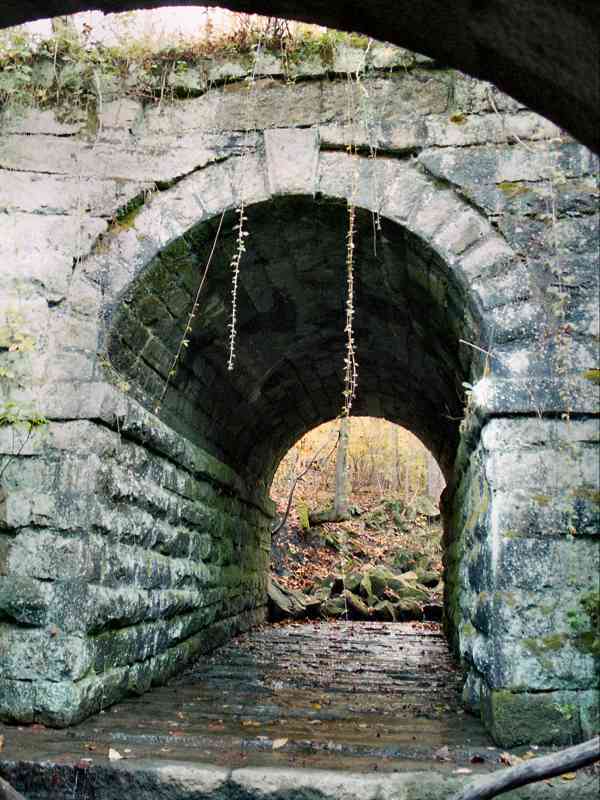 The original track alignment closely followed the river's gentle curves, but sometime later, probably around 1902 when Ilchester Tunnel was constructed, the B&O also straightened the track in the vicinity of Lees. At least one arched bridge and two stone culverts had to be rebuilt. 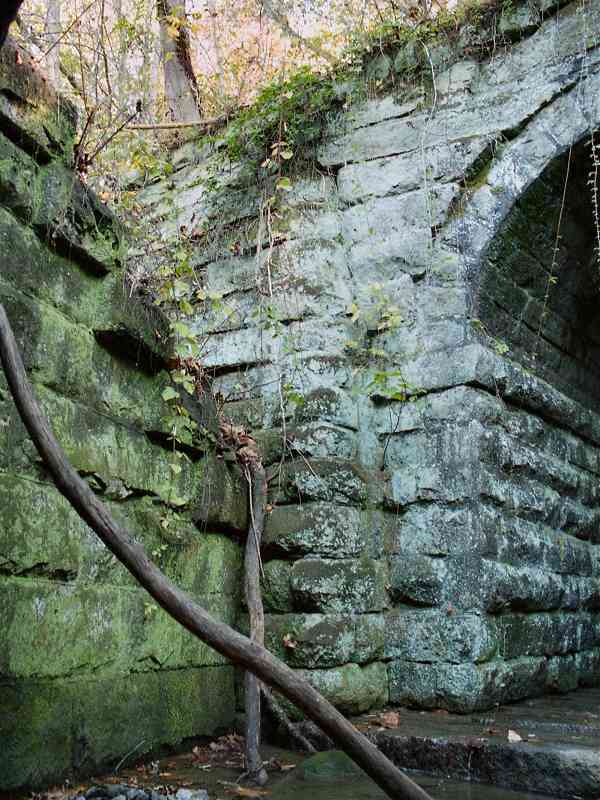 A forested stone arched bridge means one thing: a railroad track had once traversed here. When the track was straightened, this bridge became disused. A closer look reveals the crude construction style of this bridge. It is unique in several ways. 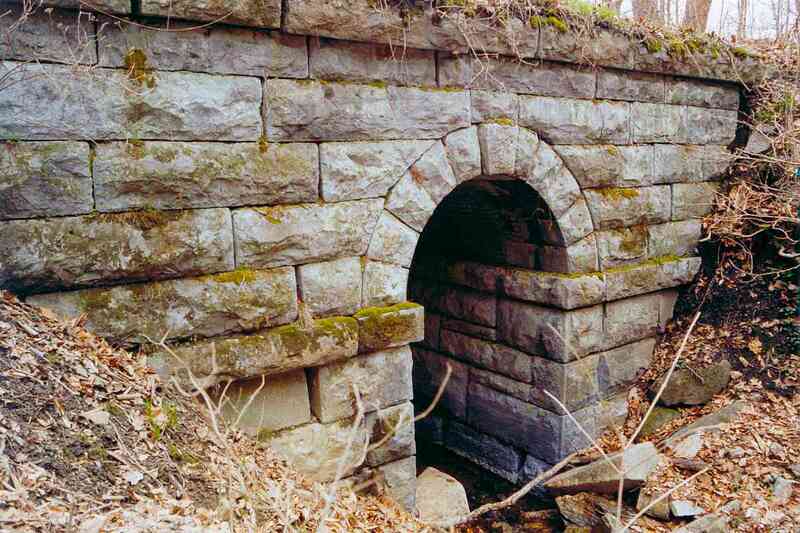 First, note the arched center portion is sits within a V-shaped stone foundation, as if the bridge had been constructed in two stages. By comparison to other B&O bridges of the same era, the stone cutting is sloppier, and the stones fit with less symmetry and care. 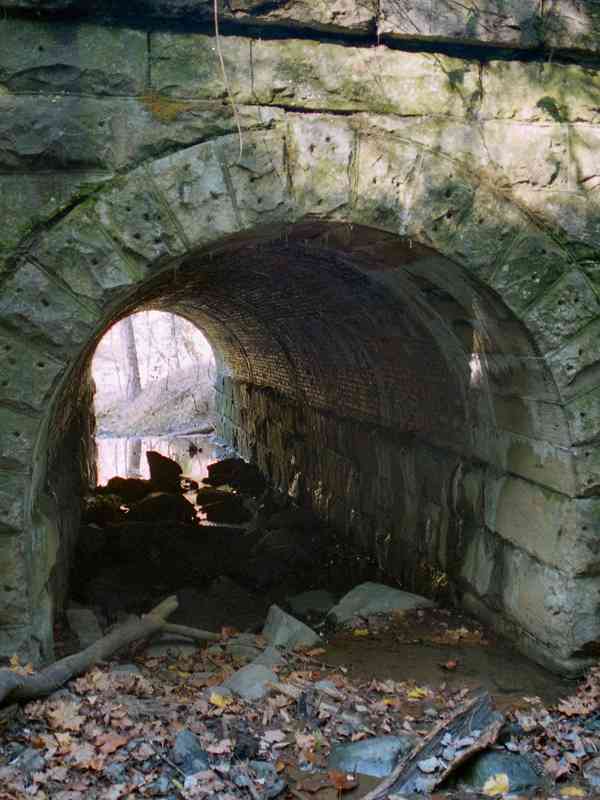 I've seen every stone arched bridge along the Old Main Line, and no other is quite like this one. My guess is it was constructed by a different crew, or perhaps as practice for other bridges such as the Patterson Viaduct less than one mile downstream. 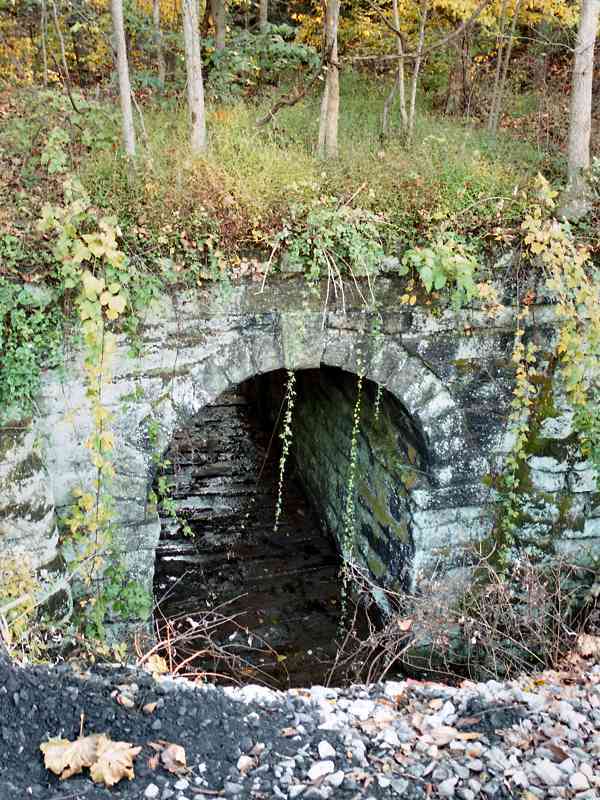 If the latter is correct this arched bridge may have been the very first completed for the B&O, predating the completion of even the Patterson and Carollton. See the difference for yourself. 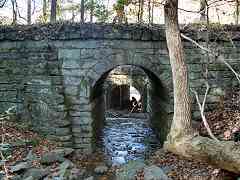 Here's a similar disused bridge located about 8 miles west, built just a few years later. 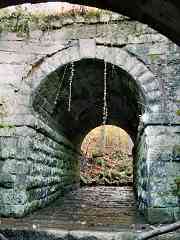 In this view, a surprise becomes visible: through the old arch, its replacement stone bridge can be seen. The realignment here was so small, the two bridges sit side-by-side. One has to wonder if all the effort was worth it for such a small amount of straightening. It's easy to get closer to the new bridge since the old provides plenty of clearance: the opening is about 15 feet high. 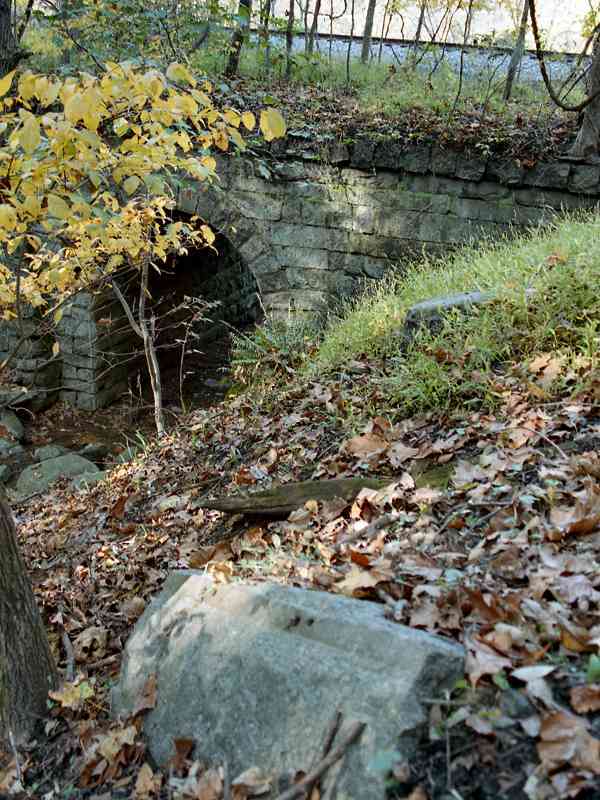 Unlike its older cousin, the newer (and still active) bridge seen in this photo employs the mortared stone and brick arch commonly found in circa 1900 B&O construction. The two cousins are so close their footings touch. 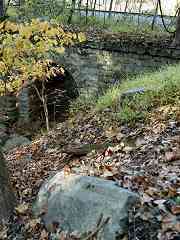 The curved arch of the newer bridge can be seen at the top of the photo as we look back toward the old. These are substantial structures. 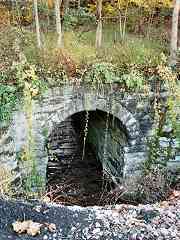 The arch seen here is about 10 feet wide, and 15 feet high at the center. There is about 6 feet between the two bridges, but they are not exactly parallel. This is an excellent spot from which compare and contrast construction techniques, if you don't mind the hike and climb. You'll see how the newer bridge uses mortar while the old does not, and the stones are cut differently. 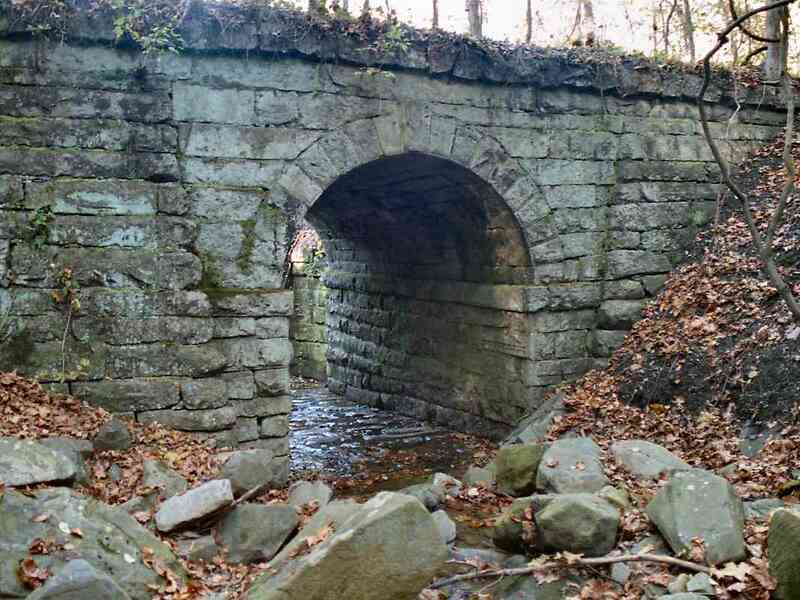 This knowledge will help as you try to estimate the age of other stone bridges along the OML. 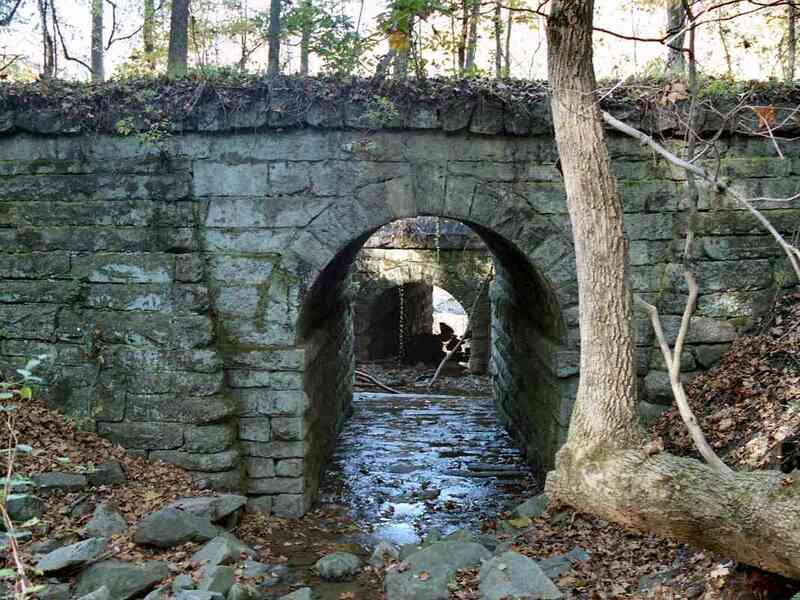 Another surprise awaits: for almost 200 years, the original B&O stone stringer in the foreground has been able to sit near a pleasant stream and watch trains go by. Evidence of where the strap rail was affixed can still be seen. A short distance west you'll find two disused culverts, one of which is depicted here. As in the other locations, the track was realigned outward, toward the river and can be seen in the distance.